But the 21-year-old striker, who scored 22 goals for Belgian top-flight club Eupen in the 2016/17 season, called off the deal at the 11th hour. 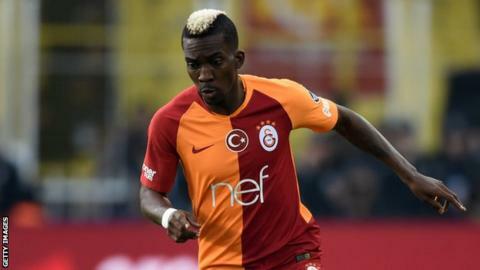 "I did a medical for Paris St-Germain on a Friday and we had to wait until Monday so they could make both signings [me and another player] official," Onyekuru told BBC Sport. "Then I spoke to my friends because I have some good friends, and I asked if it was a good idea to play in Paris and they gave me their opinions. "I also spoke to my mother and she said she just wants me to play because I'm young and still need to improve, and from there the right club will come. "So I decided to go with my mother's advice so I just cut the deal off - just like that. I told my agent to call PSG that we are not going ahead with it." The player explained that Everton had been looking at him long before that summer, and after speaking to his mother he opted for the Merseyside club. "The conversation with my mum helped my decision-making, so it was to a club with better plans for my development," said Onyekuru. "We had Everton before PSG and we all knew getting a UK work permit was going to be difficult. But their relationship with Anderlecht helped a lot in finalising things. "I was going to be an Everton player then play on loan at Anderlecht who were competing in the Uefa Champions League. "I wanted to get the exposure and experience of playing in the Champions League hence the decision to join Everton via Anderlecht." Onyekuru scored nine goals in 19 appearances for Anderlecht but suffered a serious knee injury in December, despite returning to training four months later, he was left out of Nigeria's 2018 World Cup plans. He joined joined Turkish side Galatasaray on a season-long loan in July 2018 and has 12 goals in 26 appearances in the Super Lig this season. Born in Onitsha, Nigeria, Onyekuru joined the Aspire Academy aged 13 and spent five years at the Doha-based facility before joining Eupen. In two seasons at the Belgian top-flight club he scored 30 goals in 60 matches in all competitions.